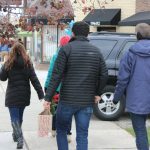 Did you come out and Shop Small in Grandmont Rosedale on November 26th? If not, you missed out on a lot of fun! 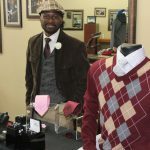 This year, businesses in Grandmont Rosedale hosted over 55 vendors, who popped up inside of seven existing business locations: GRDC’s Main Office, Cutz Lounge, Brand Camp University, The Natural Market, Rosedale Community Pharmacy, Always Brewing Detroit and Grand River WorkPlace. Vendors sold everything from soap to cookies to uniquely carved wood pieces, and more than 200 shoppers came out to purchase gifts for the holidays (and for themselves). Five more Grandmont Rosedale businesses hosted special events. The Garden Bug, Spa-A-Peel, Hollywood Hosiery, Pages Bookshop, S.T.A.R.S. Elite Training Center and Detroit Vegan Soul all got into the holiday spirit with their own specialized celebration. And we can’t forget about the fun, family-friendly activities like a DJ, food truck, estate sale, gift wrapping and Christmas wreath sales for the Vacant Property Task Force! These added a special holiday glow throughout the day. Grandmont Rosedale Development Corporation wants to thank our existing businesses, popup vendors, shoppers and activity coordinators for all of their help and hard work in making Shop Small in Grandmont Rosedale a great success! We can’t wait to see this event grow year after year. Have comments or ideas? Want to participate next year, either as a business or volunteer? Contact Martha Potere (mpotere@grandmontrosedale.com) for more information. Shoppers walking on Grand River. 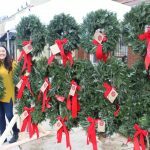 Wreaths for Sale for the Vacant Property Task Force.